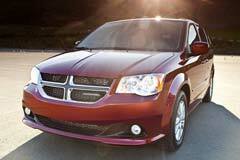 The Dodge Grand Caravan is widely considered to be one of America’s favorite minivans. Introduced in 1987, Grand Caravan was a version of the Dodge Caravan with a slightly longer body to include more cargo space. Although several new features have been introduced since then, its excellent people carrying capacity and practicality remains unchanged even today. The Grand Caravan can fit seven passengers with ease. Several cosmetic enhancements were done over the years, and the newer models included plush, luxurious interiors. The hard plastic parts of Grand Caravan were replaced by softer, classier looking features. The vehicle comes with a clever Stow n’ Go seating system that hides the entire rear seat under a flat floor, thus maximizing cargo space. Though the 283 horsepower V6 is polished and powerful enough, the transmission is a generation behind. Whether you are planning a road trip with your family, moving furniture or towing a boat, the used Dodge Grand Caravan is your perfect choice for a comfortable and settled ride.